>> 1 f da best movie dat ewa made in malayalam. especialy a big HUG for yu ikkaa... Aashiq Abu ikka...,yu did it !!! 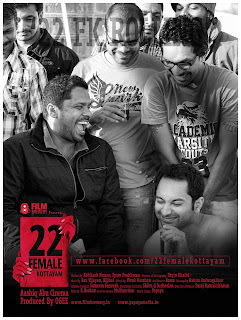 ‎22 Female Kottayam hatsoff to d whol team..
Rima Kallingal i wd say ds ur bst.. take a bow! BIG SALUTE 4 ASHIQUE ABU n TEAM....! Anoop RaveendranI saw the move last night... Congratz Ashiq Abu & crew..
Amitto Karimwonderful vishu n8...... n a beautiful movie....... 22 Female Kottayam.... a typicalAashiq Abu film...... diz tym wit a sparking msg...... "Dread the woman of today they might not be the same one you dreamt of having on bed yesterday...." as visually portrayed by 22FK! What a brilliant movie! Ashiq Abu thinking different way... nice.. I think Strong female character after "devasuram"
Just see u will like it. Leo George CherthalaWhat a movie... awesome direction..nice climax..really superb..
Rakesh KrishnanWatched 22 Female Kottayam at lakshmi theatre with Sandeep Sukumar and Athul Krishnan ...Good Movie !! Vivek Ayyadan Mpur internet publicity is great but posters are very few...pls boost outdoor publicity..
Nived NathWhen is it hitting the Dubai Screens ? Manu R MXtoday saw a great movie 22 Female Kottayam ..
a brand new breath into malayalam movie ..
awesome movie , Hats off to d director n producer who had balls to make this kinda film .